Because there are more ways to enjoy nature IRL than playing Pokémon Go. Unstructured play outside is just as important to your child's development as eating the rainbow and getting a good night's sleep. But as any parent with Wi-Fi can tell you, getting kids to ditch the screen for Mother Nature is easier said than done. To help encourage your child to let loose outside, we rounded up 25 creative ways they can enjoy the great outdoors—no plug required. 1. Two words: Outdoor Twister. Find an even patch of grass, lay down a Twister mat, then bend, stretch, and contort your bodies while also soaking in some much-needed Vitamin D.
2. Turn your yard into a playground. An easy way to entice the kiddos outside? Bring their favorite parts of the playground into your backyard. Pitch a tent, hang a tire swing, fill an unused garden bed with sand, and add a hula hoop or ball and—presto!—you have an instant play space they'll be excited to explore. 3. Care for a caterpillar. If your child finds a caterpillar wandering about—they come out in early spring—encourage her to place it in a pot and let it nibble on whatever plant she found it on. She'll have a front-row seat to nature's finest magic act, as the caterpillar turns into a chrysalis and, eventually, emerges as a butterfly. 4. Have a parade. Your kids can enjoy parading any time of year. Help them decorate their bikes and wagons with balloons, signs, and streamers before riding down the sidewalk. 5. Go for a post-dinner walk. After the last plate has been cleared, lace up your shoes and take a leisurely walk with your kids around the neighborhood. A 20-minute stroll is an excellent way to wind down together after a long day and get some fresh air and exercise. 6. Plant a food forest. Food forests are a great way for kids to get their hands dirty and may even spark an interest in the food they put in their bodies. (Hey, you never know!) These multi-tiered gardens are designed to mimic natural forests, with fruit and nut trees on the upper layer and smaller plants, shrubs, and edible perennials below. And unlike a vegetable garden, which needs to be tended to regularly, a food forest pretty much runs itself once it's planted. 7. Create a comfort station. A way to keep the good times going outside is to provide them with a few creature comforts. Think a pitcher of cold water and some glasses, fresh fruit or other grab-and-go healthy snacks, and a cushioned chair or hammock. 8. Revel in the not-so-great elements. Think your kids have to binge watch PBS on gloomy days? Think again. Instead, have them put on their rain gear and head outside to stomp in the puddles. Challenge them to see who can make the biggest splash or soak their clothes first. 9. Go camping in the backyard. Can't make it to a national park this year? Your kids can still enjoy a little slice of natural beauty by roughing it the backyard. On a mild night, pitch a tent, roll out the sleeping bags, and cook up some homemade s'mores. 10. DIY nature bracelets. Kids love souvenirs, which is why we're big fans of this DIY nature bracelet project from the National Wildlife Federation. To create, roll a wide piece of scotch tape loosely around their wrists—sticky side up—and have them attach pieces of their favorite leaves, feathers, branches, and flowers. 11. Blow gigantic bubbles. Fill up a sheet pan with a bubble mixture (or make your own with dishwashing liquid and water), and dip an oversized wand, bubble wand sticks, or even the end of rolled-up piece of paper. See who can blow the biggest bubble and whose bubble lasts the longest before popping. 12. Do indoor activities outside. A mundane activity can be more fun when you do it outdoors. Creative projects like beading kits or play dough are perfect for lazy afternoons together on the back porch. Or, lay down a blanket on the grass and take turns reading aloud from their favorite books. 13. Stargaze. Who needs books about constellations when you can see the real thing? On a clear night, head outside with the kids and try to spot Venus or the Big Dipper or—if you're lucky—their very first shooting star. 14. Go on a treasure hunt. Gather up all those forgotten figurines and action figures, and hide them around the yard. Then see how many they can find. 15. Take a picnic break. Staring down a day full of errands? Instead of drive-through, pack a delicious lunch and have an on-the-go outdoor picnic with the kids. 16. Team up with your neighbors. Join forces with parents on your block and organize weekly outdoor games. Take turns hosting the games, and stick with age-appropriate activities, like a potato sack race, Marco Polo, or ring toss. 17. Keep a nature journal. Kids are nothing if not observant. Encourage them to keep a nature journal, where they can sketch cloudscapes, note how a tree changes each season, glue their favorite flowers, and make leaf rubbings. 18. Play with water. Fact: Kids will jump at any excuse to splash around in water. 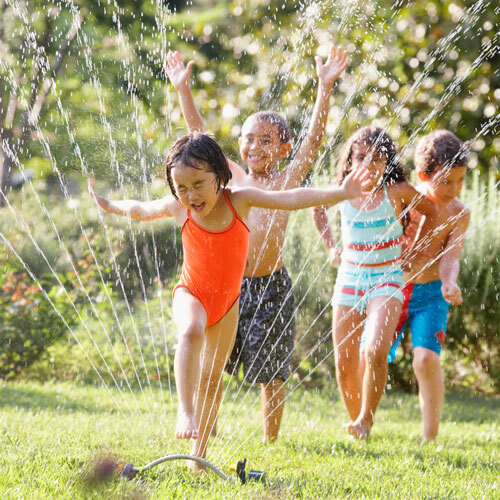 Give yours an age-appropriate task, like washing the car or watering the garden, let them run through the sprinklers, or build a water table they'll want to use all season long. 19. Give them a place to call their own. When is a big cardboard box more than a box? When it's nestled in the shrubbery, of course! Then it becomes your kiddo's very own hideaway that they can do with as they please. 20. Go on nature walks. Your neighborhood is a treasure trove of bird feathers, beautifully gnarled sticks, and Insta-worthy leaves—you just have to get out there and discover them. Be sure to walk slowly so your child can survey his surroundings, and bring an empty bag so they can bring their treasures home. 21. Make a date with nature. If your family swears by its calendar—and whose doesn't?—then pencil in some pre-planned outdoor excursions, like hikes in nearby trails, a charity fun run, or visits to a local farm. 23. Start a worm farm. Give your child yet another reason to play in the mud—and get more mileage out of your food scraps—with a worm farm. To create, you need little more than a couple of containers, newspaper, food scraps and, of course, worms. After three months or so, keep an eye out for vermicompost, a rich soil you can use in your own gardening. 24. Decorate the sidewalk... and driveway, and porch, and any other smooth surface with sidewalk chalk art or a hopscotch course. Turn them loose with a bucket of colorful chalk and an open piece of pavement. 25. Tie dye a shirt—with a squirt gun. Hand over a squirt gun filled with brightly colored fabric paint, and chances are you'll have to beg your child to come in for lunch. In this super fun (and super messy!) project, hang up a plain white t-shirt and have your kiddo design it by firing paint all over it.